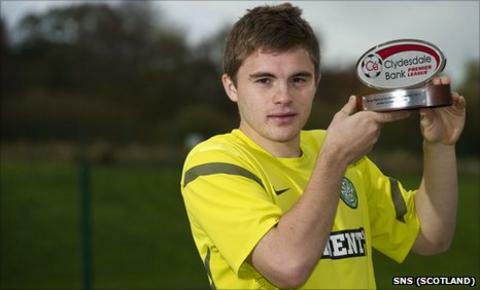 Celtic's James Forrest has been named Clydesdale Bank Premier League young player of the month for September. The winger fired a double in Celtic's 4-0 home win over Motherwell at the start of September. The 20-year-old also netted against Inverness in a 2-0 victory at Celtic Park later in the month. Forresy recently added to his tally of international caps by playing in Scotland's Euro 2012 qualifying matches in Liechtenstein and Spain. Rangers manager Ally McCoist and Ibrox midfielder Steven Davis won the Clydesdale Bank's manager and senior player awards.